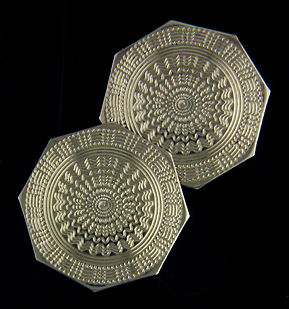 Art Deco white gold cufflinks, circa 1920. Several nights ago a few isolated snowflakes fell as I was walking the dog. Meanwhile, the constellation Orion was peaking up over the horizon. All signs of winter. It is once again time to celebrate the coming season with a flurry of snowflake cufflinks. The term "snowflake" is commonly used to describe white gold or platinum cufflinks that shimmer with exuberantly engraved designs. Particularly popular in the decades around 1920, these sparkling cuff jewels capture the light hearted, optimistic spirit of the age. The variety of intricately engraved patterns that decorate snowflake cufflinks is phenomenal, almost as varied and unique as natural snowflakes. 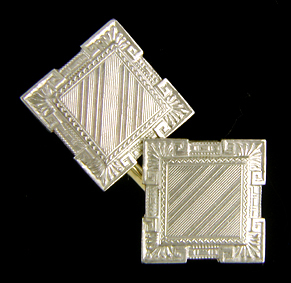 The dramatic white gold Art Deco cufflinks pictured above are a nice example. WAB jazzy spiral and scroll cufflinks, circa 1920. Wordley, Allsop & Bliss was one of the more prolific makers of fine cufflinks from the firm's founding in 1907 until the 1930s. WAB and its successor firms created cufflinks ranging in style from late Victorian to late Art Deco Moderne. 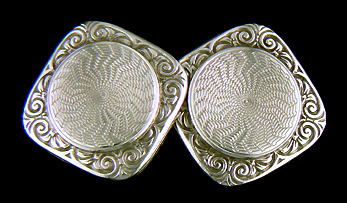 These white gold cufflinks from the early 1920s feature jagged spiral centers surrounded by richly scrolling borders. They reflect the early Art Deco preoccupation with leaving no surface undecorated. Link & Angell barley turned cufflinks, circa 1920. Link & Angell was another maker of fine cufflinks during the early decades of the last century. These beautifully engine turned cufflinks are decorated in a pattern known as "barleycorn". The repeated, petal-like design and the frostiness of the white gold, inspired us to nickname these cufflinks "Winter Rose". Crafted in 14kt gold around 1920. Wintry Art Deco diamond cufflinks, circa 1925. These frosty white gold cufflinks always remind me of a field of freshly fallen snow in the winter moonlight. The shimmering white of the the gold and richly detailed engraving give the cufflinks a sparkling, almost crystalline appearance. A small diamond set in a navette setting adds to the wintery brilliance. Crafted in 14kt white gold around 1925. Ziething "Radiating Wave" cufflinks, circa 1925. The word "pizazz" could have been invented to describe the jazzy cufflinks created by Ziething & Co. during the 1920s. The firm excelled at creating dramatically engraved cufflinks that seem to radiate, not just reflect, light. This pair with radiating wave-like centers surrounded by dramatic track borders is a beautiful example. Crafted in 10kt gold, circa 1925.